Alan & Megan Adkins are 1 of the many families we met last summer at Pine Cove Family Camp. We had a mutual friend that helped us connect, but both having big families & a heart for adoption, we had plenty to naturally connect on. So glad when God drops these unexpected kinds of people in your path to encourage you and build you up. "There's two sides to orphan care. On one side you rescue a child from their brokenness. On the other, a child rescues you from your selfishness." "I think our family is proof positive that Gods plans cannot be thwarted (can you ever use the word thwart other than using it with the word “plans” - it’s a weird word, right?). Even with less than perfect motives from our selfish, self serving selves - His plan always emerges victorious! I would love to tell you that I had a clean heart the entire time while pursuing adoption for our family. There were definite times of clarity and a desire to have a heart like His, for sure. For instance, the moment that I was scraping food from dinner into the trashcan and realizing just how much excess we had - that was Gods heart awakening in mine. I cried over that trashcan at the amount of waste in food, shelter, time, resources, etc. that our family had to give, but were being thrown away daily. I wanted adoption to be part of our families story. I wanted to have the biological story AND the story by ADOPTION. So, to make my (our) plan work, I put all sorts of limits and stipulations on the entire thing. We would do one child, no special needs, legal risk only. Young so as not to have the child have too many issues or barriers to attachment. Although I do believe that each family should pray about what they feel equipped for in the area of adoption, I cannot say for sure that I prayed about any of the above. And I kinda fantasized about what type of adoptive family we would be. I mean, we might even be the kind that needed to be on a poster or something (as ambassadors of adoption of course). People would maybe look to us and see how amazing we were, YEA US! We are AMAZING! A real person. Jake, who didn’t ask to be adopted. Jake, who has his own struggles. His own gifts. And, Jake who has blessed us immensely with his megawatt smile, his merciful heart and his BOUNDLESS energy! Jake, who DIDN’T reach for me for the longest time. Jake, who stiffened even as a baby in response to hugs. Jake, who didn’t know AND didn’t NEED all the expectations that I had put on him before he even arrived at our door. Jake was 14 months when he joined our family. At that time I had a 5 and a 7 year old, and a 6 month old baby. We were building a home and living in a temporary apartment. I was stressed. And I needed this new little one to ASSIMILATE. Ha - Jake didn’t get that memo. He was needy. Whiny. And didn’t instantly LOVE me. Imagine that. I was so focused on my part of this adoption story that I did not fully take in what it meant when a baby had experienced the loss of TWO caregivers (bio mom, and a previous foster family). I didn’t factor in that attachment was to be my number one concern. I didn’t factor in that meeting all of his needs was showing him, day by day, how much the Father loved him, and how He too, would meet Jakes needs. 5 years later, I have grown some. Though the urge to drive my own plan down everyone else’s throat still happens daily, I am becoming more and more aware that saying yes to God’s plan, also means saying Yes to admitting learning that His ways are involved in every aspect of His plans. And I am learning that He is patient, OH so patient in teaching this stubborn selfish, me- centered heart that it is in serving that will bring His kingdom to earth as it is in Heaven. Since the adoption of Jake, (5 years later) we learned of 3 of his biological sisters that were in care. We immediately were faced with the choice to pursue in order for them to be together, or pretend that they never existed, and continue on our track to raise our current 4 children. Did we pray this time? ABSOLUTELY. We knew if a little 14 month old baby could still have struggles with attachment, and with trauma, and with loss - that these sweet girls who had been living in several homes for the past 5 years and had experienced trauma in their lives that NO person should experience, would have a tough time. We knew that the urge to be compassionate is not a constant. That it would be a fleshly desire to want them to rush through the healing process (and ASSIMILATE) - and that we would need Jesus’ help the whole time to give them the room and time to heal. I am so grateful that my own selfishness did not deter God’s plan for our family. Our children, all of them, make our family rich with diversity, fun, and a cacophony (we are hopeful for a harmony to happen any day now) of personalities that make every single day an adventure. We are so incredibly grateful to be their parents. We are so incredibly grateful to serve a Father God that loves us more than we can comprehend, and who reaches down and equips us daily for the work here. We are also so grateful to be made AWARE of the weaknesses we have - because it shines the light on just how STRONG He is. Thank God for honest people willing to share, even their less than shiny parts, for the glory of God! 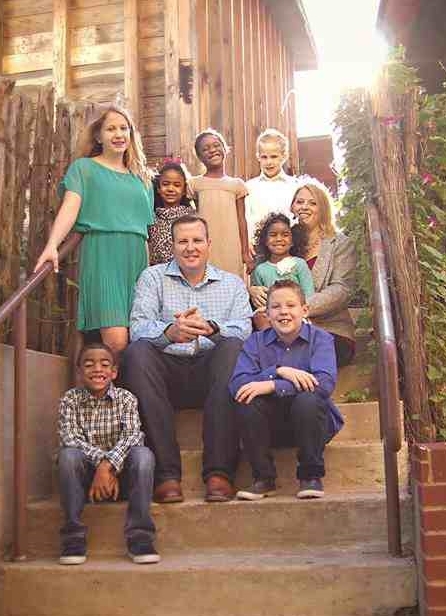 For more on the Adkins' on-going journey in orphan care & adoption, check out Megan's blog: www.gracegritandwit.com. It is a GOOD one!! !